Load previous tabs - This option forces Explorer++ to save the current tabs and settings - either in the Windows registry, or in the portable XML file - and restore them on startup. This ensures that your Tab bar (and the settings for each tab) are “just the way you left them”. Load default folder - This option tells Explorer++ to just open the default (new) tab at startup - no previous tabs will be loaded (but see Note and Tip below!). The Info and Tip following are applicable to the current version (v1.35) - future versions may vary from this behavior. Explorer++ saves any tabs and settings from memory variables when the application is closed; changing from the previous tabs setting to default folder in the Options dialog only changes the setting. At the next startup, however, the memory variables will contain only the tab information specified by the setting - the previous tab settings are still in the registry or XML file, at least until Explorer++ is closed. must be set to 1 (restore tabs). must be set to 1 (2=Load default folder). Settings in the XML file should be in alphabetical order; the StartupMode setting occurs around line 59. You can edit the file with a text editor like NotePad (not a word processor!). The usual caveats apply for Windows registry editing - don’t attempt this if you are unsure. Enabling this option (ie. checking the box) tells Explorer++ to save and fetch all its settings in an XML (config.xml) file, located in the installation folder, usually …\Program Files\Explorer++ v1.2 (your version might be different). An XML file is a text file, structured hierarchically to enable Explorer++ to re-construct its settings, etc. at program startup. At startup, Explorer++ always looks for a valid XML file in the correct location, and if it is found loads it and uses those settings. The actual setting value for portable mode is not saved, either in the Windows registry, or in the XML. and the portable mode option must be disabled (ie. clear the checkbox) prior to closing Explorer++, to avoid re-writing the XML file. Note that Explorer++ creates the XML file (if this setting is enabled) immediately upon closing the options dialog. This option allows the user to select a default folder to be used when a new tab is opened. 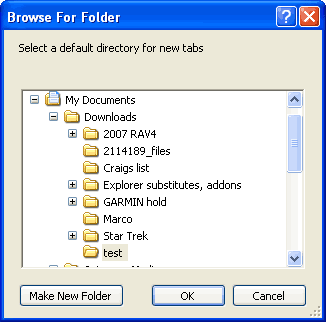 The option presents a typical Windows Browse For Folder dialog, allowing the user to choose a folder. Prior to using this option, the default folder is My Computer. If a folder is set by this option, then subsequently is renamed or deleted (ie. folder cannot be found), new tabs default back to My Computer. if enabled will prevent display of some folders by this dialog. This behavior exists even if Explorer++ is set to display hidden items, since Explorer++ has no control over this dialog. 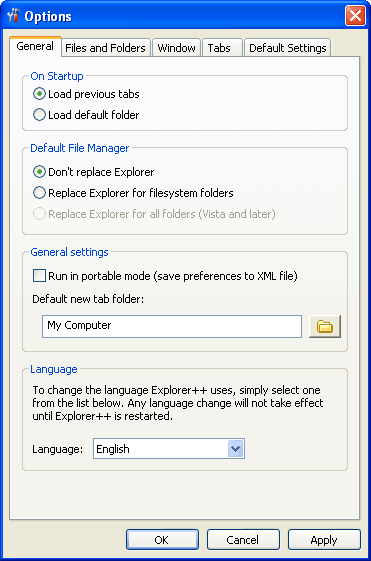 It is recommended that both of the above settings be changed to display all files and folders when using Explorer++, and to use its own control of these attributes. 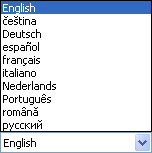 Once the DLLs are placed in the Explorer++ installation folder, the languages will appear as choices on the language drop-down (or drop-up!) control for this option. Japanese, Korean and Chinese require support for East Asian languages to be installed. This installation is available from the Control Panel Regional and Language Options applet. Sinhala requires installation of either the SinhalaTamil Kit (Windows XP) or possibly a Sinhala LIP (Language Interface Pack - Windows Vista/7, untested), available from Microsoft Sri Lanka. The translations are incomplete, but are an excellent start to the globalization of Explorer++. To check the status of a translation, update a translation or submit a new translation, please see this project’s page on Crowdin.